What I have tried from Gucci's make up line has really impressed me so far-one of their lipsticks is a permanent fixture in my handbag, their bronzer was amazing (review here), their glosses are gorgeous and their mono shadows come in some beautiful colours. I've mentioned before that the black and gold perspex packaging feels quite 80's and like old school classic Gucci rather than the more modern, ornate style of late but actually I like it a lot. The shades in the Rose Quartz quad aren't my typical bronze tones and it's taken me a while for this to grow on me-but it's getting there. 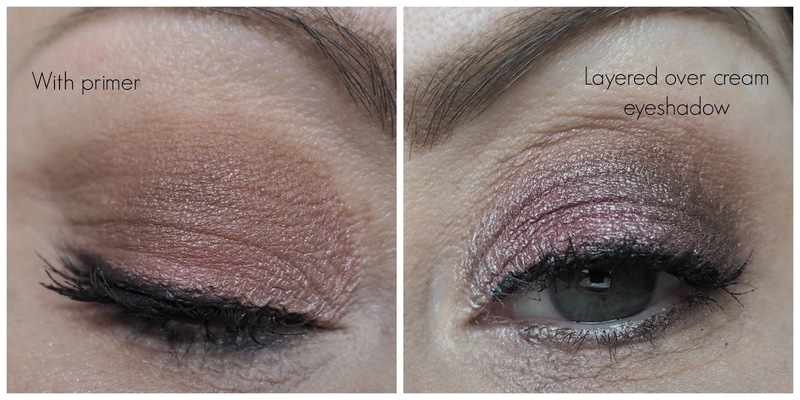 There's a perfectly toned matte light brown shade that is brilliant for carving out the crease, a light shimmery pale peachy pink shade, a shimmery pink/lilac and a shimmery mid brown with subtle lilac reflects through it-it looks much darker in the pan than it pulls on the lid. With a primer, I have to be honest, I felt the colour payoff was poor. There's very little fall out and the shadows blend beautifully, but they blended to pretty much nothing and the differentiation between the shades was difficult to pick out. But, layered over a cream eyeshadow stick, I'm getting much prettier results. The shadows are sticking the the cream base and that is pulling out and boosting the pigment within the shadows. I love the iridescent shimmery look and by using the cream eyeshadow stick as a base, the longevity is incredible. But the brown shade still isn't as pigmented as I would like it to be even though I actually think layered on top of a cream it is super pretty. The quad definitely lacks a dark shadow as a contrast to the other tones-but it's a very soft, Spring appropriate palette. I actually don't think the photos below do justice to how pretty the palette is over the eyeshadow stick. Using a cream eyeshadow stick is my number one tip for eyeshadow-it makes pretty much all eyeshadows punchier and longer lasting. I mainly use Trish McEvoy, Bobbi Brown and Kiko ones and I pretty much use one daily. I don't think this will be a palette that I reach for really really frequently but I think the pink shade in it is so unique in my collection that this palette will be a very pleasant rediscovery in my collection from time to time!